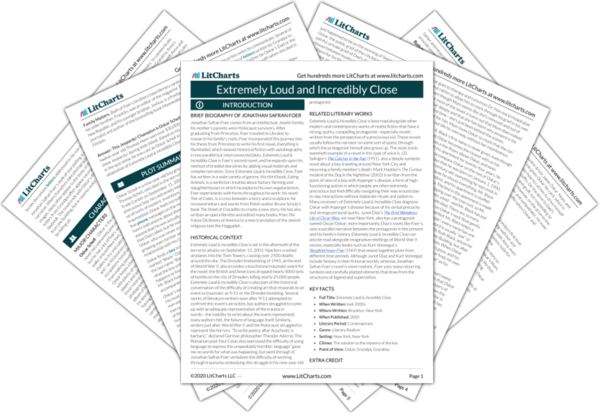 Instant downloads of all 946 LitChart PDFs (including Extremely Loud and Incredibly Close). 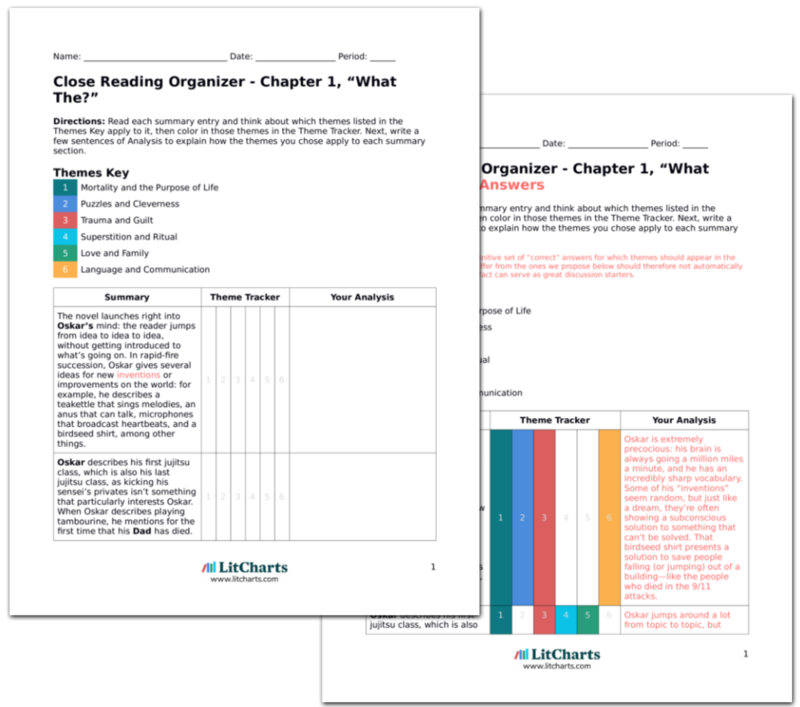 LitCharts assigns a color and icon to each theme in Extremely Loud and Incredibly Close, which you can use to track the themes throughout the work. Oskar is the narrator of this chapter. He describes the bracelet he made for Mom after Dad’s death, in which he converted Dad’s last voice message into Morse code and depicted it in different-colored beads. Oskar is upset that Mom has been spending time with Ron, her new boyfriend, but he buries his anger and instead makes Morse code jewelry out of his Dad’s messages. Oskar attempts both to assuage his own guilt and connect with his Mom through the bracelet. There’s no way she would ever know how to decode the beads, or even that they’re trying to convey a message at all. The novel is full of such messages, expressions of love either never delivered or impossible to understand. The message preserved here is more for Oskar’s own benefit: he’s trying to preserve his Dad’s voice, and this is another way of doing so, like keeping the phone in his closet. He’s also trying to keep his dad connected to his mom, as he is angry at her growing connection to another man. Since his Dad’s death, Oskar has had trouble with several triggering things, like showers, crossing suspension bridges, and being around Arab people (even though, he clarifies, he’s not racist). The public tragedy of the September 11 attacks and Oskar’s individual grief for his Dad have become woven together in Oskar’s mind. One night, he rummages around Dad’s closet and tries to pull down a blue glass vase he’s never seen before. The vase breaks, but when no one comes to chastise him, Oskar, out of relief and guilt, gives himself a bruise. When he starts to clean up, he finds a little envelope with a fat, short key inside the vase that Oskar’s never seen. He tries all the locks in the apartment, but it isn’t for any of them. Oskar frequently bruises himself when he feels guilty or embarrassed or ashamed: it’s his way of punishing himself physically when he feels like he has done something wrong emotionally. Throughout the novel, many secrets are kept inside containers in closets or boxes—the key, the phone messages, etc. The next morning, Oskar fakes sick—the first lie he has to tell, he reports—and goes to the locksmith to ask about the key. The locksmith says that it looks like it’s for a lockbox, probably a safe-deposit box. Oskar convinces himself that all his lies are to protect his Mom and preserve the integrity of the expedition; ironically, his Mom soon finds out exactly what he’s doing. 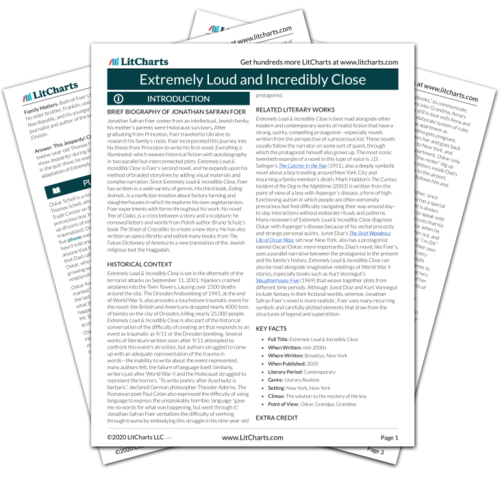 Get the entire Extremely Loud and Incredibly Close LitChart as a printable PDF. When Oskar returns home, Stan, the doorman, gives him mail: a form letter from Ringo Starr with a signed T-shirt. (The T-shirt isn’t white, though, so Oskar can’t wear it: one of his rules is to only wear white clothes.) Oskar laminates the letter and puts it on his wall. Oskar doesn’t seem to care when he receives a form letter instead of a personalized response: he’s searching for any kind of reply to try and help fill the void that his Dad has left. Oskar calculates that there are 162 million locks in New York City, and it would take him three seconds to open each lock, but there is a baby born in New York every fifty seconds, so that if all he ever did were open locks, he’s still be falling behind by .333 locks every second. At first, discovering what the key might unlock seems as impossible to Oskar as finding closure after his Dad’s death: he could search and search for his entire life, but he might never be able to find an answer that might assuage his guilt. Oskar retrieves the envelope that the key had been in and sees the word “Black” written on the back. His Dad’s handwriting looks weird, as though it were written hastily. He Googles “Black” and puts some of the image results, like a shark attacking a girl and a soldier getting his head cut off in Iraq, into his binder of Stuff That Happened To Me. But the envelope with the key that has the word “Black” gives Oskar a rejuvenated sense of purpose, since it seems like a message from his Dad, as though Dad were giving him another clue on his expedition. The next day, Oskar fakes being sick again to his Mom so that he can skip school. They chat and Mom tells him that he sounds just like Dad, but Oskar says that it doesn’t make him feel good when she says he sounds just like Dad, so instead, she rubs his head quietly. Oskar’s Mom tries to connect with Oskar and bond with him through their shared loss, but Oskar isn’t ready to let her in yet; instead, he still bristles when his Mom brings up his Dad. It’s harder for Oskar to discuss the raw trauma with someone so close to him than to talk about it with strangers. Oskar goes to the art supply store because he wants to ask them about colors. The employee thinks that it’s interesting that “Black” is written in red pen. The employee shows Oskar a pad of paper near the pen display, on which people have tried out the different colored pens. Jonathan Safran Foer inserts four pages of this pad into the book, with the whole array of colors and handwritings depicted. When Oskar examines the pads of paper in the art store, Jonathan Safran Foer recreates that experience for the reader, so that the reader can continue on the expedition along with Oskar. Oskar notices that one of the pages has his Dad’s name, “Thomas Schell,” on it. (The name is written in red ink on the last page of the colored handwriting that is inserted into the chapter.) He looks through all the tester pads throughout the store and sees that his name was everywhere: according to Oskar, “It was as if he was planning on making the biggest art project in history.” But Dad died over a year ago, and the employee tells Oskar that she’s ninety percent sure the display pads have not been sitting out that long. If the reader was looking closely, he or she might have seen “Thomas Schell” before Oskar points it out—but if not, it’s almost impossible not to flip back and look for it, and then to look at the other pages for clues. Jonathan Safran Foer turns the experience of reading into something akin to going on one of Oskar’s expeditions. In this case, the reality of the situation becomes clear in hindsight: it is Grandpa who has been writing his own name, testing out pens in the store. Back at home, Oskar discovers 472 people in New York with the name “Black,” living at 216 different addresses. He writes a letter to his French teacher, pretending to be from Mom, to say that Oskar will no longer be going to French lessons, although the teacher will still be paid; that way, Oskar will have Saturdays and Sundays free to go around the city and ask all the people named Black about the key, which, he calculates, will take him eight months. Oskar decides that “Black” must be a last name, allowing him to narrow down his search drastically, from hundreds of billions of locks to 216 addresses. Meanwhile, the lies escalate: rather than tell his Mom what he’s up to, Oskar decides that he has to protect her and that he will do the search on his own. Trying to fall asleep, Oskar flips through pictures in his Stuff That Happened to Me binder, and Jonathan Safran Foer includes the pictures in the chapter: a wall of keys, Stephen Hawking, Hamlet, a blueprint of a paper airplane, two turtles making love, a box of gems, a man falling from a building, Manhattan with Central Park removed, a blurry close-up of the falling man, “Purple” written in green ink, a tennis player celebrating a win, fingerprints, early human-like primates, and an astronaut. Oskar’s binder is stuffed with stuff that didn’t actually happen to him: it’s more like a fossil record of his imagination than a transcription of what he encounters in the world. Many of the images represent stuff that he’s thinking about, or stuff that’s important to him symbolically, or ideas that he has, but, ironically, very few of the images in the binder represent things that actually happened in Oskar’s daily life. Oskar listens to Dad’s phone messages again. He keeps the phone inside his closet—he didn’t want his mother to find it, so he’s hidden the old phone and bought a new one. Oskar still feels, even if the feeling is irrational, responsible for Dad’s death because he didn’t pick up the phone, and he feels too guilty to talk to Mom about it. Oskar’s Grandma lives in the building just across from him, so he can see it through the window. He radios her on his walkie-talkie and asks why she’s awake at 4:12 AM. She says that the renter is running some errands. Even though the renter had been living with Grandma since Dad died, Oskar hasn’t met this mysterious renter. Grandpa and Oskar both have insomnia, but the real reason they stay in touch at all hours of the day is that they’re both afraid of being abandoned again. Grandma even keeps the walkie-talkie on at all hours of the day or night so that she’ll never miss a message from Oskar. Oskar and Grandma talk for a bit over the walkie-talkies, as they do very often. Oskar tells Grandma that he misses Dad. He asks her why Grandpa wanted to leave, and imagines a device that would flash out of ambulances to tell everyone if the person inside was going to be okay. Grandma says Grandpa had to leave, but she doesn’t say why. Grandma is one of Oskar’s primary sources of love and support, yet she doesn’t talk to him very much about his past; instead, she remains focused on what’s going on in the present, as though she’s trying to erase the past. Oskar puts the key from the vase on the string around his neck, next to his apartment key, and makes lists and conjugates French verbs, trying to fall asleep. The key from Dad’s closet and Oskar’s apartment key rest over his heart, and they keep him tethered to his home and his family. Raphel, Adrienne. "Extremely Loud and Incredibly Close Chapter 3, “Googolplex”." LitCharts. LitCharts LLC, 24 Jul 2015. Web. 24 Apr 2019. Raphel, Adrienne. "Extremely Loud and Incredibly Close Chapter 3, “Googolplex”." LitCharts LLC, July 24, 2015. Retrieved April 24, 2019. https://www.litcharts.com/lit/extremely-loud-and-incredibly-close/chapter-3-googolplex.